Some callback interface may be registered via a new EventRegister() method - similar to ServiceRegister() - on both TSQLRestClient and TSQLRestServer sides. In fact, a callback / event can be seen as a service, but in the reverse order: from server to client. Those interface shall have methods with no result, i.e. defined only as procedure, never as function: they are meant to define events (or messages), not actual request-response calls. Due to this stateless implementation design, events will be executed on the server side asynchronously: in the server code, interface method calls will be added to an internal FIFO, and return immediately, without waiting for the client to be notified. Then the clients will retrieve and handle notifications, at their own pace. 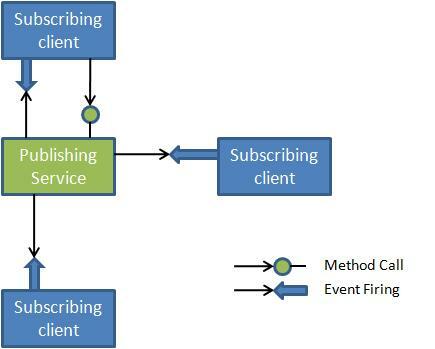 Clients needing to receive those messages will call an overloaded EventRegister() method, with an implementation class corresponding to one of the server-side registered interface: this will implement a strong and KISS publish / subscribe pattern. The interface will define the so-called "topics" to be published. Lock-and-wait request, similar to the Comet implementations. In fact, both implementation modes may coexist: IMHO the lock-and-wait request may trigger a dedicated polling request. It is up to the client to add a lock-and-wait channel if its reaction time does matter, or if the heart-beat period is problematic. TSQLRest callback internal methods will be abstract, knowing nothing about polling or the underneath communication used. We will try to code the most generic implementation, allowing polling and lock-and-wait for HTTP, but certainly some dedicated mechanism for other protocols (in-process, GDI, named pipes). The mORMot architecture was designed to be truly RESTful, without the necessity to mimic HTTP, e.g. using its headers to transmit data, cookies for session handling or WebSockets for push emulation. The framework also implements direct in-process, GDI messages and named pipes communications. In fact, since GDI messages are two-way communications, we may implement a direct callback feature (via a simple PostMessage API call), with no polling; and maybe change the named pipe mode to duplex, or allow direct callback event for in-process/stand alone access. So we should never be stuck to one implementation, but open to alternatives, and able to use the fastest mean of communication, depending on the transmission protocol involved. In the future, the HTTP part may use WebSockets, but it is currently not compatible with the http.sys kernel-mode server provided by Windows, and blocked by some packet inspectors / antivirus, since its content is not valid HTTP. Since calls are added in a server-side FIFO, it could be the root of proper off-line synchronization of multiple clients: if a client is disconnected from the server, all future events will be stacked on the server side, and sent on the next available connection, to be replayed on the client side. We may therefore consider using not only memory, but also an ACID database to handle the message queue - e.g. via a dedicated TSQLRecord-based virtual table. As we already stated in the beginning of this article, such a publish / subscribe pattern would also benefit on the server side. At data persistence level, we may, for instance, add a dedicated IORMEvent interface to the TSQLRestServer instance, publishing all CRUD operations of the ORM, directly from its core (for both internal and external DB engines), so that Event Sourcing features would be available to any number of subscribers, even with on-the-fly registration. Generic per-table consolidation or backup/replication features may be therefore be activated on need. At application level, you may easily add external gateways (like a SOAP service or some HTML/RSS content), or integrate authenticated third-party components. At domain level, it could be used to communicate between domain objects, in an Event Collaboration pattern, e.g. between multiple processes or PCs. Similarly, an integrated scheduler (like cron) could be made available on the server side, with a dedicated threading model (not to interfere with the client-server process). A whole horizon of extensions to the framework... we are open to any proposals! So it would probably be the next feature to come, just after 1.17 release. Stay tuned! Feedback / ideas are always welcome on our forum!